This round Victorian tobacco box measures 4 1/2 inches wide x 3 5/8 inches tall and transferred in blue green. 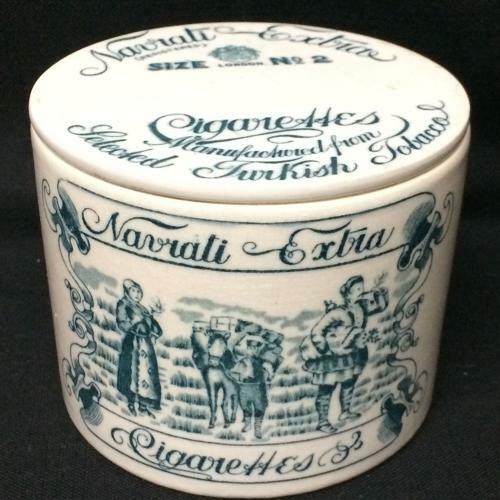 The piece made in England, with original lid, was filled with selected Turkish tobacco cigarettes sold commonly at the general store's counter. The container sports a repeating image of a family of tobacco farmer with their fully laden donkey. The piece is in good condition, best transfer we have seen. A small shrinkage line to the base made during the potting process.